Ready to live the dream and work for yourself? Worried about startup expenses? 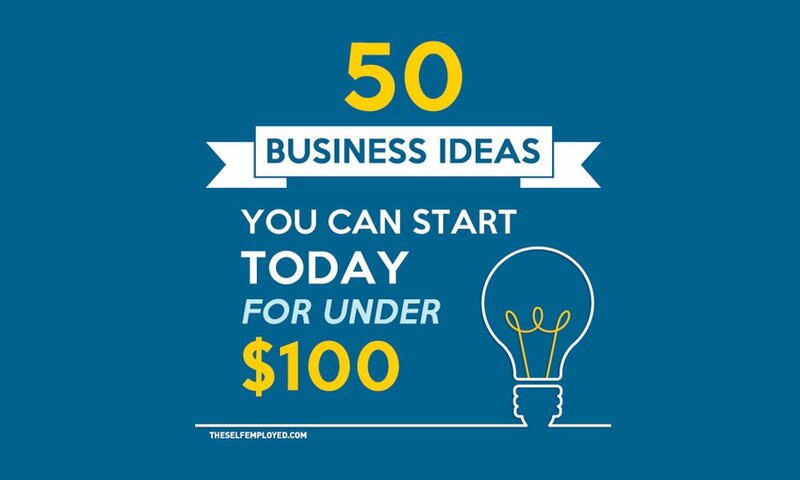 Here are fifty self-employed business ideas you can start for under $100! Starting your own business is the dream for many. The ability to set your own hours, to determine the type of work you do and earn your income as you wish is a freedom many consider worth pursuing. And, if this sounds like something that interests you, now may be the perfect time to do so. According to data from the Bureau of Economic Analysis of the United States Department of Commerce, from the years 2000 to 2011, 99% of the total increase in employment was from the self-employed. Becoming self-employed is goal for many want-to-be entrepreneurs, but knowing exactly what business to start and being able to afford the startup costs can be a barrier. Luckily, there are plenty of opportunities for those willing to learn and put a little elbow grease into their career path. If you’re looking for a little motivation or inspiration to get you started, below you’ll find 50 self-employed business ideas you can start for under $100. Now, now you just need to pick one! PDF is the most useful format among Self-Employed Business. If you are looking for the best alternative to Adobe Acrobat. Free download PDFelement (Windows or Mac) here >>. Unique visual branding is a smart way to distinguish your business from competitors. Logaster is at the forefront of design programs that guide your efforts in crafting a winning corporate identity. Read the article “How to Create Your Brand Identity” to find out more”. There’s something rewarding about taking care of someone else, especially in the later years of their life. With 77 million baby boomers entering into their senior years, the senior business sector is a growing industry. In many cases, as they are getting older, seniors are looking for a way to stay social and get out and about. If you have a passion for helping the elderly, a home companion business may be the perfect idea for you. You can also create a business in this sector by becoming a senior care consultant or an elder caregiver. If you like the idea of working with food, but not necessarily worrying about preparing it, you might want to consider a meal planning service. With meal planning, you help people take the guesswork out of what to prepare and eat each week or month. As this trend is catching on, you may want to focus on a specific dietary need such as gluten-free, vegetarian or paleo menus. With the surplus of cleaning services available, one way to differentiate yourself and stay up with current demands is to offer a green cleaning service. One benefit of this business opportunity is that with a little research you can come up with cost-effective cleaning solutions that you can create yourself. If your customers like your cleaning solutions, you can even branch out and sell versions of the product you are using. If you have some time and a computer, becoming a social media consultant or starting a digital marketing company may be just right for you. The other prerequisites needed include being comfortable online and using social media platforms and a love for talking to people. To get started building your portfolio, work with a few nonprofits in you area or offer your services at a discounted rate to local business owners. While some major grocery store chains already offer online shopping and delivery, not all stores are covered with this convenience. Local and natural food stores are ripe resources to consider creating a delivery partnership with. A simple way to get this business going is to contact local stores and work out a deal to deliver groceries to customers for a fee. Another option is to provide your own online purchasing options for groceries you are willing to stock. When a customer makes an order through your site, you can go purchase the items and deliver them. This option allows for you to work out wholesale or resell partnerships with local stores so you can make revenue not just on the delivery fees, but the products themselves. Often projects go off the rails due to poor management ending up costing companies extra time and revenue. However, not all companies can afford a full time project manager. They may only need one for a specific project. This is where a project management service comes in. As a project manager, you can work with all types of businesses and industries. Your job is to help the company get their project completed on time and on budget. What’s better than finding someone who can repair your broken items? Someone who will come to you and do it. Mobile repair covers so many areas from cars to computers. If you have a knack for fixing things and you don’t mind driving around to do it, you may have your perfect business opportunity. Not everyone “gets” the subject they are currently studying. In fact, people who need some extra coaching may not even be taking classes. There are many areas of our lives where we could use a little bit of help with improving, including art, computer skills, organization, cooking, etc. If you are skilled in a specific area that other people have trouble with and love to teach, those skills tutoring or teaching may be your calling. With so many people competing for desirable positions, your resume is one area you can’t afford to mess up. If you offer a service that can help job seekers stand out amongst other applicants and have a better chance at getting the job they desire, you could build a thriving business helping other people. With illnesses, rising childcare costs and other factors to consider, more and more parents are looking for custom solutions for childcare. You may even be looking for a way to stay home with your own children, while still earning revenue. One way to meet this need is to offer in-home child care with additional benefits that might not be available at a large facility such as individualized attention and learning programs. Before starting this type of business, however, it is crucial that you check local laws and regulations. If you love to write, but aren’t quite ready to churn out a novel, you might want to consider freelance writing. With content marketing become a key aspect for companies, there are more and more job opportunities opening up for writers. To get started, check with some local businesses in your area and see if they need help with blog posts or creating other information products such as reports or short ebooks. Design is certainly a skill that lends itself to self-employment. No matter what type of design you do, there are going to be companies that need your services. The key is to work on your portfolio and get a few referrals under your belt. Use the web to search for freelance job opportunities and establish a client base. If you don’t want to work with actual clients, you may want to instead consider using your design skills to create products such as business cards, website templates and stock illustrations that you can sell on sites such as Etsy. There’s no denying that ecommerce is a powerful business model. However, who wants the hassle of storing and delivering all the products necessary to create an ecommerce business? If you like the concept, but aren’t a fan of the actual business, you might want to consider a dropshipping partnership. This way you get to focus on specific aspects of the business you enjoy instead. Affiliate marketing may be one of the easiest businesses to start. All you need is a website and some partnerships with vendors in a niche you are passionate about and knowledgeable in. While easy to start, you will need to put some real effort and time into driving targeted traffic to your website to generate sales. Do you have specialized knowledge in a specific area? You might want to consider starting a consulting business. You’ll find consultants in just about every field. Their job is to help other people do their jobs easier and more efficiently. If you love throwing parties and are hyper organized, party planning may be just be your dream business. To help you stand out in the crowd, you might want to consider focusing on a specific niche such as weddings, corporate events or conventions. If you love to write, but don’t want to freelance, you may find starting your own blog more appealing. There are many revenue opportunities from blogging including affiliate partnerships, sponsorship, product sales and advertising. Not to mention, blogging in a topic you’re passionate about can be deeply rewarding and fulfilling. In a similar vein to blogging, creating information products for sale can also be a lucrative low-cost startup idea. If you have knowledge in a certain area, you can create courses, ebooks or videos (or all three!) that others can purchase and download. The ideas for this business model are limitless. You only get one chance to make a first impression, and many stores have to make that impression with their storefront. Help local businesses keep their shine with a business window cleaning service. To start, target local stores that are close together to save time and money. Love pets? Consider putting that love to work with a dog walking or pet sitting service. While only 3% of households annually hire a pet sitter, this number is on the rise. If you think this is a hobby job, you might want to think again. The national average for pet sitters is $16 per visit. If you’re keeping an eye on eight different pets a day, that could earn you up to $32,00 a year. Add in some additional dog walking or homemade pet treat services and that number could grow exponentially. While we may be able to see exactly what someone else needs in a particular situation, figuring it out your own life isn’t always as easy. That’s where a life coach or mentor can be of help, especially if you specialize in a specific area. This particular business idea is lucrative because it’s inexpensive to get started and the fields of specialty are endless. You can coach or mentor in any area from sports to weight loss, organization to personal happiness. Amazon and Apple have made book publishing a field just about anyone can enter. If you have a wealth of knowledge in a particular subject, creating and publishing your own books might just be your ideal business. The key here is to enter this business with the goal of creating multiple books related to your subject matter. The more books you can create the better. When you are comfortable with the process, consider helping other authors publish their works for a fee. If you have a big network of friends and acquaintances, and you don’t mind selling, you may want to have a go at becoming a direct sales consultant. Most of the reputable companies offer starting costs under $100 and provide training and team support to help you succeed. This is a great idea for someone who wants to branch out on their own, but wants a little help and support behind them. Make your business helping other people start their businesses! Business plans are needed to help secure loans, investments and to make sure you keep your business running on target. If you have a keen knack for creating business plans, considering helping out one of the fastest growing employment areas – the self-employed! Are you handy when it comes to repairing furniture? Taking old things and refurbishing them, or even upcycling the various parts into something completely different, is a great way to earn a bit of extra cash. With this business Craigslist and social media are your best friend. Fix up a few pieces at a time and offer a “sale day” where people can come by and see everything you have. Or, just sell your pieces one at a time through Craigslist listings. If you’re a graphic designer, but don’t want to be attached to huge projects, you might want to consider becoming a logo designer. The projects are typically simple and straightforward and you probably already have everything you need to do the work. To get started building your portfolio, contact local businesses, nonprofit organizations or government agencies for work. You can also expand your services by providing logos and other branding images for use on social media profiles as well. There are a lot of laws restricting what food products you can and can’t sell out of your home, but as long as you’re following them, there’s always a great market for delicious homemade treats. If you’re at home in the kitchen, this may be the perfect business idea for you. With the growth of different diets, you have a great opportunity to carve out a niche for yourself in a specialized area such as low carb, gluten-free, vegetarian, paleo, etc. You can start out small and test your recipes with local food stores. Similar to making your own gourmets foods, you can also create your own natural soaps or beauty products. The trend for going natural in all areas of our lives is growing and this is an area with some real potential. If you’re not up for actually making the products, you could refer to the previous ideas in this article and either set up a dropshipping relationship with vendors you trust or create a blog related to this topic. If you love cooking up a feast for special events, consider starting a catering business. You’ll need to check with local laws and regulations before starting. However, many in this field find it an extremely rewarding experience. They key to success with this business idea is to find a speciality that is unique in your area. You can focus on a certain cuisine, dietary needs, or type of event. Companies like TaskRabbit are already employing this idea, but they’re only available in certain cities. Offering similar services in your local area could be quite lucrative if you’re willing to do the tasks at hand. This can be especially fruitful if you are offering your services to the senior market. This demographic isn’t as able to get around and would benefit greatly from having someone they trust run some local errands for them. The best part about being a virtual assistant is that you can do it from home. Most of the tasks for a virtual assistant are computer related, so as long as you have a computer, internet access and a phone you are set. With this business you’ll want to make sure you have a few clients at a time to ensure you can work the hours needed. Since the benefit of a virtual assistant is that a person can hire them for as much or as little as needed, you’ll need to account for peaks and lows in weekly hours. It’s probably no surprise that pet grooming is a growing business. In 2012, 62% of households had pets. That’s a lot of animal baths! As a groomer, you can not only handle pet bathing, but also other basic grooming needs. If you have the resources, you can expand your business by offering a mobile service as well. More and more companies are venturing into other countries and want to reach more demographics. This means the need for translation services are growing. Website translation is an especially growing area since their is a global reach. If you know a few languages, you might consider offering your services as a new business opportunity. The phrase “there’s an app for that” has never been more true than it is today, but there’s always room for a new idea or a better implementation of something that’s already out there. From developing an app for a company to creating something for yourself. All you need is a great idea and the technical know-how to actually build it. Selling your stuff on eBay can seem like a great way to earn a few bucks on the side, but for many people it’s too much of a hassle to research prices, take pictures, put together a good post and keep track of payments, shipping, etc. The idea of selling something online is appealing, but when it comes down to doing all the work many would just rather donate the items in question or let someone else sell it for them. For this business idea, you would just need to reach out to friends and family and see if they have anything they’d like to sell. You can do all the setting up of the shop and products, and you can split the profits. And, if you don’t like eBay, consider Craigslist instead. If you have a love for taking pictures, consider making it your new business venture. This is an area where having a speciality will help you stand out. You can focus on typical portraits or consider other areas of photography such as travel, nature, food, corporate portraits or corporate photography. While people may not need someone to cook in their home for them, they may need some extra help during their busy day with lunch or even breakfast. One of the benefits of being a personal chef is that you don’t necessarily have to cook at a person’s home. You can also offer foods that are already prepared that just need to be reheated. This is a great way to offer your services to a larger amount of people without having to be committed to one client or customer. Health is a high priority for many, and losing weight and getting fit are top concerns in this area. If you have a track record for helping people with their fitness in a specific area, you could have a very profitable business. Like many of these suggestions focusing on niche or target area can help you stand out as an expert in a growing industry. For many people, a computer problem that could be a simple fix winds up being a drawn out warranty nightmare. While we may know how to breeze our way through apps, many of us are not as comfortable with the hardware that powers our machines. Computer repair is a great low cost business startup, especially if you offer mobile computer repair. Getting started is as simple as building up a reputation for being the “go to” computer handyman. Get the word out to your friends and family about what you’re doing and you’ll be off to a great start. In today’s connected world, people can often feel out of the loop when it comes to new technologies, and the constant stream of new products means it’s only going to get worse. If you have the patience and the teaching ability, it could be a great idea to start a business getting the “technologically inept” up to par with the current software. Cleaning up a cluttered garage can be a daunting task, but having some outside help that is able to assess the situation objectively can be a huge benefit. Offer your services to help people empty out their garage, and follow it up by helping them sell the overflow with a garage sale. If you’re willing to do some research and learn how to frame and cut glass, picture framing may be a great business opportunity for you. Once you have the skills, the benefits to this business are pretty obvious. You can work from home and determine your own hours and clients. There are huge markups in the framing business, which means you can earn more while working less – every business owner’s dream. Not everyone has the time or ability to get their own groceries. You can offer a needed service and work your own hours by completing someone else’s shopping list. This is an especially helpful service for new moms, seniors and if you are diet conscious, those with dietary restrictions or special dietary needs. Have a green thumb? Now you can make some extra green selling your plants online. This is a newer growing niche, but with concerns over seed origins growing, this could be a lucrative business venture. This business will be somewhat seasonal, but you can offer garden design and landscaping plans during the off season to help provide some additional revenue. Do you love making things? Use your talents to generate a profit with an online craft business. With sites like Etsy, selling your homemade goods has never been any easier. It’s especially helpful if you focus on a specific trend or niche that fits into a specific category. This will help you get found easier and will help people share your products on sites like Pinterest easier as well. The state of some foreclosed homes definitely leaves something to be desired. However, getting them cleaned up and ready for sale is necessary evil that someone has to do, and that someone might as well be you. You can find out if there is a need in your area for this type of work by contacting some foreclosure agents to see who to contact about cleaning the homes. With privacy and security concerns at an all time high, now is the perfect time to consider a business as a internet security consultant. You can help educate people on setting up their home networks and securing their personal information. You can also work with companies by helping them secure their websites and their business/customer data. Are all your socks in matching pairs and neatly organized in their drawer? If so, a business as an organization consultant might be right up your alley. Not everyone has the ability to control the chaos. Luckily, organization consultants can help in a number of areas from personal organization to business organization. If you’ve been reading this list from start to finish, you’ll know that the pet business is a huge industry. As long as there is a desire for a family pet, the need for dog training is always present. One way to set yourself apart in this area is to offer mobile and home training. With a mobile service, you can help train animals in the home setting as well as help train them in social settings like dog parks. If you have a love for local history and lore, becoming a local tour consultant might be your perfect business idea. You can start off by simply offering walking tours of your city or specific history regions within your city. You’ll need to contact your local city offices to make sure there are no laws or regulations that would interfere. However, if you’re good to go, the only thing you need to get started is a website with your tour information and some local word of mouth to start your first tours. You may want to consider partnering with your local visitor’s bureau to help attract tourists to your business. Previous articleAsk an Expert: Think Big! Next articleNeed To Get Your Business Funded? Head On Over To . . . Staples! Thanks for the useful list man,its really making sense,I am gong to choose one of the business to make money at home and also I also I will suggest my friends to get some knowledge about the business.Keep doing this great work,have a great day. Agreed. AGREED. To anyone starting out on starting a business, I first state that if you are looking for the generic “best business” to start, then you are already off to a bad start. The impetus must be an organic, inward out, truly, self-generated idea. You have to have some kind of connection to this profit-generating concept. Maybe this is an algorithm and you know the code inside and out. Maybe it is a really smart way of doing food trucks that would work only in your market. Maybe you have a prototype of a product borne out of hours or a lot of experience circumventing some kind of problem. Maybe the guy who knows all this stuff in any of the aforementioned scenarios is your brother, cousin, close relation, or co-worker and you both can form some kind of working symbiotic relationship to market the concept. In either case, the potential profit-generating concept usually exists before the “what kind of business do I start?” question ever arises. Even then, people looking to go into business must be smart in seeking out funding and avoid exposing themselves to too much risk (don’t use all of your own money), seek funding, and still be lenient enough to leave themselves a reasonable exit strategy (should the plan be de-railed to the extent that any potential profit is lost/assets are unrecoverable). If you think just starting a dog-walking business, catering service, or whatever is profitable and easy as baking a duncan hines cake, I may have a few more businesses that didn’t make the list. You might look into becoming a professional balloon blower-upper, childrens’ birthday party planner, wedding singer, e-book writer and publisher, importer/exporter, dog trauma counselor, professional friend, and a professional gift-wrapper (man, it is sooo difficult to get those damn big boxes wrapped perfectly every time). In short, there are businesses that nearly everyone can start. In reality, almost everyone who starts a business will fail in that business, while some will try and fail again (and few will try again and become successful). Some will succeed and eek out livings similar to what they already do in their day jobs (and few will become wildly successful). If you are looking to get into business, be informed, approach everything with a great dose of optimism and even greater skepticism. Don’t be afraid to take calculated risks (and even some whoppers every now and then) and don’t be afraid to fail (but fail smartly and learn from it). Looking forward to start the catering business of my own and earn some descent earnings from it. Nowadays, earning money becomes really challenging and tough task because there are hard competition in every field but here you have given some really great business ideas which can help anyone to make some money easily. Wow very interesting list of businesses you quote here.I must say earning is no more difficult for today’s men. This is the great idea for me to start home made food business. Getting into business needs a full time attention, if you really want to succeed you should choose the one that you have the passion, nevertheless you will not be able to give your full blast on it. Aside from that you may get help from business expert or try to attend seminars, training or read books about handling a business and how to earn profits. You may try to visit Mind Strategics Learning Consultancy and check out in what fields in business you need help. In choosing the best business there are some things that must consider. You may consider your passion, expertise, lifestyle, available capital and return of investment or profit. Of course before getting into the business you should know if it is profitable or not. But, consider the fact that in any business, there are struggles which you need to overcome with the help of expert entrepreneur like Dr. Sundardas who is on top of the business since he started 25 years now. If you want to get help from him, try to visit Mind Strategics Learning Consultancy. Good list although some things on this list will most definitely cost more than a $100 bucks to start. You have to look at the cost of licenses, being bonded, and insurance. You don’t want to skimp on the important stuff because it can come back to hurt you in the end. If anyone is on a tight budget, I suggest starting an Internet-based business. There are higher profit margins because there is little to no overhead expenses. Thank you very much for giving me great ideas to choose new work. sir i want to know is e-mail marketing maybe a good self employment for us? Great list of ideas for business. I have to print it. Thanks.